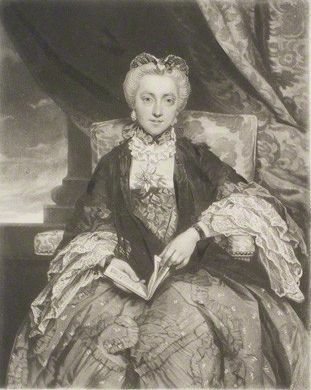 Emma, Countess Mount Edgcumbe, after Joshua Reynolds. National Portrait Gallery. The family had repaired to the dining room, the gathering was a sombre one on this day of mourning. As darkness gathered around the hall candles were lit, casting shadows on the dark panelling of the room, their dim flickering light seeming to accentuate the deepening gloom. As they sat down to their sad repast, Earl Mount Edgcumbe, seated at the head of the table, rose to his feet planning perhaps to say a few words about his beloved wife, Emma, so recently laid to rest in the family vault. All eyes turned expectantly towards him, he stood slowly and composed himself to speak, seconds passed but no words came. His eyes grew wide and glassy, his mouth fell open in silent horror, slowly he raised his hand and indicated the source of his terror. As each head tremulously turned in the direction he indicated, the room fell into a deathly silence. Silence broken only by the sound of a delicate scratching – or was it tapping – coming from the window and the dark night beyond. There, standing in the moonlight wrapped in her shroud and pale as bone, stood Emma, Countess Mount Edgcumbe, returned from the grave. This is my terribly hammy horror pastiche of part of the tale of unfortunate Emma, Countess Mount Edgcumbe. Emma married the Earl of Mount Edgcumbe in 1761 and legend says she was the victim of premature burial. The story recounts that Emma died and was sealed up in the family vault at Maker Church, however a rapacious sexton had spied a rather valuable ring that he quite took a shine too. Returning to the cover of darkness to retrieve the treasure, he unscrewed the Countess’s coffin and proceeded to pull the ring off her finger but found that it was stuck fast, nipping her finger rather hard he was horrified to find the ‘corpse’ suddenly sat up and asked where she was. Understandably the Sexton left in a hurry (never to be seen again, one suspects) leaving the befuddled Emma, wrapped only in her burial shroud, to walk the half mile or so back to the old ancestral pile. To this day the Mount Edgecumbe Estate has a ‘Countess’s Path’ commemorating Emma’s journey back to the land of the living – and to her startled family. She died more permanently in 1807. But is it true? The story is current in the Devon/Cornwall area and was passed down the generations of the Mount Edgcumbe family. However the whole story fits the popular folk-lore associated with tales of The Lady with the Ring rather too neatly. The earlier tales include that of Frau Reichmuth Adolch in sixteenth century Germany and other English variants such as Lady Wyndham. These tales are common across Europe and found as far afield as North America. Usual features are: the ring, the sexton and the moonlit walk from the burial ground, and the family mistaking the returned lady for a ghost (1). The tales would seem to say more about our primal fear of premature burial than of actual events as virtually none can be proven beyond doubt. Besides, if the tale of Emma is true then the Mount Edgcumbe family seem particularly unfortunate in this respect as in the preceding century another Countess Mount Edgcumbe, Anne, was said also to have suffered this fate! So why is the fear of premature burial so common? How likely is premature burial? And what can be done to avoid it? Such questions plagued writers, doctors and plenty of ordinary people in the 18th and 19th Centuries. It inspired literature (particularly Edgar Allen Poe: The Premature Burial and Ligeia and features in various other tales); it led to changes in the law surrounding burial; to ingenious methods of prevention and to vital scientific enquiry. True Tales of premature burial? Stories of ‘True’ premature burials abound. One of the earliest was recorded by Pliny the Elder in the 1st Century AD, he recounted the tale of Consul Acilius who awoke with a scream as his funeral pyre began to burn; Thomas A’Kempis who died in 1471 was a candidate for canonisation until his coffin was opened and his corpse was found with splinters under the fingernails; apparently it wasn’t seemly for a potential saint to wish to postpone meeting his god! Many other such tales were regularly recounted, both as oral traditions (such as the tale of Emma) and in newspapers and even medical journals such as the Lancet. Other evidence cited to support the prevalence of premature burial was found when Les Innocents Cemetery in Paris was moved, many skeletons were found to have shifted position in their coffins. Cases where coffins had been opened to find corpses with bitten fingers, scratches and looks of horror on their faces all added to the popular fear. A famous case reported in 1901 involved the pregnant Madame Bobin who ‘died’ of Yellow Fever on her return from Africa. Her maid doubted the diagnosis and with the help of Madame Bobin’s father opened the coffin to find that the woman had turned over in her coffin and given birth to a foetus. Add to this the regular outbreaks of contagious diseases such as Cholera, where corpses had to be despatched quickly and often without being viewed by a doctor, and the fear of going early into the grave was intensified. The main problem seems to have been that despite that fact that people had been dying for simply ages, know one was actually sure how to tell if someone was not just a bit dead, but really dead. This was first explored in ‘Mortae Incertae Signa’ (Uncertain Signs of Death) by Jaques Benigne Winslow in 1742. This study which began to explore the problems surrounding identifying the ‘moment’ of death in amongst the process of dying resulted in changes in the law in some countries to reduce the chances of premature burial. However, in hot countries burial remained of necessity swift (Petrarch the famous poet, was himself almost buried alive in Florence in the fourteenth century, after falling into a trance). Robert Wilkins in his wonderfully macabre and entertaining book ‘The Fireside Book of Death’ notes lists the signs of death as: insensibility, temperature, respiration, circulation, rigor mortis and putrefaction. However relying on one of these features alone would not necessarily signify death – catalepsy might result in insensibility, coma patients are often cool to the touch (whilst Cholera victims might have a high temperature); the heart continues to beat for a time even after decapitation. Wilkins also notes that in fact some of the signs of death might actually have been seen as signs of burial alive. Wilkins notes that much of the supporting evidence for burial alive can be dismissed as the natural actions of the corpse: cries for help become post-mortem belches, nibbled fingers and scratched faces are likely the result of ravenous rodents, bodies found outside coffins most likely blew themselves up as their gasses fermented – the strength of such gas could easily force a foetus from a womb and anguished expressions are caused by the muscle contractions of rigor mortis. But of course for many centuries this was not know and the actual diagnosis of death was a very sketchy business and not even always carried out by a medical doctor (it was not always a legal requirement for a doctor to even view a corpse before certifying a death). At the beginning of the nineteenth century there were up to 30 different theories about how to definitively tell if a person was dead. So much was this fundamental issue on medical minds that in 1837 a prize was set up for anyone who could establish death with any certainty. In 1846 Eugene Bouchut won 1500 francs for suggested the use of the newly invented stethoscope – if the heartbeat was absent for 2 minutes then death was certain…strangely nobody had thought of this before. Then in 1885 one Dr Maze suggested that the only certain sign of death was putrefaction….he was not the first to think this. As early as 1788 Dr Joseph Frank had suggested keeping bodies 2 -3 days before burial and by 1792 the ‘Vitae Dubiae Asylum’ – The ‘hospital for doubtful life’ was set up in Weimar, Germany. For those concerned by the prospect of premature burial, Germany in the nineteenth century was probably the best place to expire. Waiting Mortuaries were particularly popular in Germany lasting until the 1880’s. Munich had several such establishments, Munich Leichenhaus, where corpses of the newly departed were laid out until putrefaction set in. They were displayed in zinc trays filled with antiseptic and decorated with scented flowers and could be visited by relatives keen to ensure that the dearly departed really were dead before they were interred. Of course there were class distinctions even in death – with a luxury section for the exclusive use of the wealthy departed! New York Bellevue Morgue, public domain image. The Morgues were staffed 24 hours a day and each body was cunningly rigged up so that the slightest movement would trigger a bell. After a mid-century Cholera epidemic it became compulsory for bodies to be taken to these mortuaries(3). Nevertheless, it is unknown if these precautions actually saved anyone – the QI website claims that between 1822 -1845 46500 people were taken to waiting mortuaries but none found to be living. In fact, despite researchers such as Franz Hartmann collecting above 700 ‘true’ cases of premature burial in his much derided 1895 book, much of the medical establishment remained highly skeptical about the chances of it actually happening. Dr Brouardel in his 1902 work ‘Death and Sudden Death’ was particularly dismissive of the claims that up to a third of people may have been buried prior to true death. Too many of the tales simply could not be verified or could be explained away by natural processes of decay. Nevertheless, it pays to be on the safe side…. Alice Eve, buried alive in James McTeigue’s 2012 film The Raven. 1. Join a premature burial society – no, not one that encourages it, one that tries to prevent it. In 1896 the slightly unscrupulous Arthur Lovell set up the London Society for the Prevention of Premature Burial. For a fee members were guaranteed a thorough going over by ‘experts’ upon their demise. Wilkins’ notes that it was not only their bodies that would receive a thorough going over – if family members failed to notify the society of the death of a member, the departed’s entire estate was forfeited to them! 2. Seek proper medical advice. Many of the cases of premature burial stem from untrained persons misdiagnosing death, doctors not necessarily being present. Even doctors are not infallible – why not choose one with access to a Necrometer? This handy device can tell even the most recently qualified medical person whether a patient is: alive, nearly dead, or completely dead. 3. Make sure you are really dead. You can do this in a number of ways – both Wilkie Collins and Hans Christian Anderson carried around detailed instructions about this. Grimaldi the famous clown went to the extreme of insisting on a post-mortem decapitation, so did Harriet Martineau the Victorian Author. She also went a step further and declared if her wishes were not carried out her bequests would be null and void. 4. Try not to die in a hot country – hot countries tend to prefer swift burial for hygienic reasons as the unfortunate Dr Chew found out. In 1874 Dr Chew ‘died’ in Calcutta where burial was usually within 24 hours. But for his observant sister spotting some movement at the 20th hour, he would have met a grisly fate. 5. Invest in a safety coffin. In 1893 the nervous John Wilmer of Stoke Newington set up an elaborate home-made alarm system. Buried in his garden, a switch was placed in his hand so that should he awake underground he could ring a bell in his house. The most famous safety coffin was that designed in 1896 by the wonderfully named Count Karnice-Karnicki Chancellor to the Tsar of Russia. For the reasonable fee of 12 shillings you could rent his device – a tube running from the coffin to an airtight box above ground. A glass sphere on the chest could detect the tiniest movement which would then set off a spring mechanism to open the tube to let and air and light. The tube would also amplify cries for help – which would either bring swift assistance or scare the bejesus out of any passersby. More up to date safety coffins are now available, courtesy of Fabrizio Caselli whose 1995 design included an alarm, intercom, breathing apparatus and a flash-light. If you want to be really cutting edge, more contemporary designs now include mobile phones and computer games to while away the dull hours before rescue arrives. “…Maureen Jones, a 65-year-old grandmother from Yorkshire, who collapsed at home in 1996. Her son called the GP, who decided that she had suffered a stroke and was dead. The undertakers were about to put her in a hearse when a policeman noticed her leg twitch and at once performed heart massage. Mrs Jones’s eyelids began fluttering and she opened her eyes. Having worked in the medical field for 34 years including in an urban hospital, in the ER for 7 years, and in cardiology, I can conservatively estimate i have done CPR on over 600 patients. After working for a half hour or so one soon realized “dead meat don’t beat”. I will keep this short since i could write a book about it all. A person’s heart often does not go from beating to not beating, but sometimes continues a rhythm useless to circulation call EMG (electro-mechanical dissociation). I had one patient we worked on for awhile and when i went to wrap her up to take her to the morgue lo and behold she was actually still alive. I have also had a couple people we did resuscitate who told about the classical tunnel of light, and one lady said she saw her little doggie who had died years before running towards her. Nowadays, if we have any doubt, we do an EEG to determine if there is any brain activity. Some young head trauma victims still have a good heart beat and we then beg the family to let them be an organ donor, which everyone should be. Since i am claustrophobic one of the worst things i can imagine, even if i am dead, is to be shut into a coffin then into a vault then buried in the ground, so i have chosen cremation. I am sure in the past when medicine was young and even in cultures where burial was required by religion to be within a day many have been buried prematurely, a horrid tragedy scarier than a ghost story for sure. Wow, it sounds like you have some tales to tell there – it just goes to show that it is more a process of dying, a group of factors that combine, rather than an actual pin-pointable ‘moment’ of death. I am also glad that we live in a society where medicine is advanced enough to allow organ donors to help save lives when their own has ended. Ah, I loved this post so much that I had to re-blog! Show Lenora some love please by hopping over to her blog and following!!! Brilliant post. Do you think that this could have been the reason for wakes with open coffins? I have always been slightly anxious about the thought of being buried alive and have never been able to watch any horror films on this theme. You hear such horrible stories especially in plague pits where excavations have shown bodies in crouching positions trying to get out. Doesn’t bear thinking about. Thanks Miss J, I don’t know if wakes are intended to make sure the dead person is really dead, but it’s possible! While I was writing this post I mentioned it to a few people and its amazing how many people are still really worried about premature burial! I watched the 2010 film Buried and found it a really claustrophobic and uncomfortable thing to watch. Can’t imagine a worse fate. I really enjoyed this post Lenora, most interesting and scary! I did read somewhere that during a wake, if the ‘corpse’ was still alive, the celebrations would ‘wake’ them up! I don’t know how true this is, though! I came here via Ingrid Hall (thank you, Ingrid). A fascinating post and I tweeted it. Like supernova1c I’ve read that the purpose of the open coffin wake is to prevent premature burial, but I can’t substantiate it because I don’t remember my source. Makes sense, though. I’m a bit disappointed that it’s not for preventing premature burial – I seem to remember a pretty funny moment in the Poldark series when the drunken Jud Paynter wakes up in his coffin during his wake! Thanks to everyone for helping to answer my question about wakes. It never occurred to me before reading Lenora’s article that the role of wakes might have originally partly been to prevent premature burial.